This page covers the author of Shopgirl. For other authors named Steve Martin, see the disambiguation page. 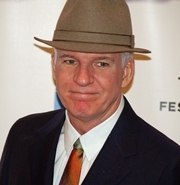 Steve Martin has 3 media appearances. What's the deal with book clubs? I mean, if reading is such a solitary endeavor, why bring other people into it at all? What kind of a devoted reader interrupts their precious "book time" to chat about a necessarily undefinable emotional response to literature? It sounds to me like they didn't want to be reading that badly in the first place! BINGO. Join Flippo and Steve(n) at BookPeople on the last Monday of every month for the STAND UP SIT DOWN Book Club, where we will discuss the mirth and mayhem of the greatest comedy memoirs yet written. This month's book is Born Standing Up by Steve Martin. Please remember to tip your waitstaff. Steve Martin, An Object of Beauty. Stephen Glenn "Steve" Martin (born August 14, 1945) is an American actor, comedian, writer, playwright, producer, musician and composer. Martin was born in Waco, Texas, and raised in Southern California, where his early influences were working at Disneyland and Knott's Berry Farm and working magic and comedy acts at these and other smaller venues in the area. His ascent to fame picked up when he became a writer for the Smothers Brothers Comedy Hour, and later became a frequent guest on The Tonight Show. In the 1970s, Martin performed his offbeat, absurdist comedy routines before packed houses on national tours. Since the 1980s, having branched away from stand-up comedy, he has become a successful actor, playwriter, pianist, banjo player, and juggler, eventually earning Emmy, Grammy, and American Comedy awards. "Steve Martin" is composed of at least 9 distinct authors, divided by their works. You can edit the division. Steve Martin is composed of 4 names. You can examine and separate out names.